Do you have some good test cases for this problem? the 6 is on the negative cycle but is not printed out. Can you explain me why please? Hey so sorry I was viewing the problem all wrong , I get it now thanks so much for your time! 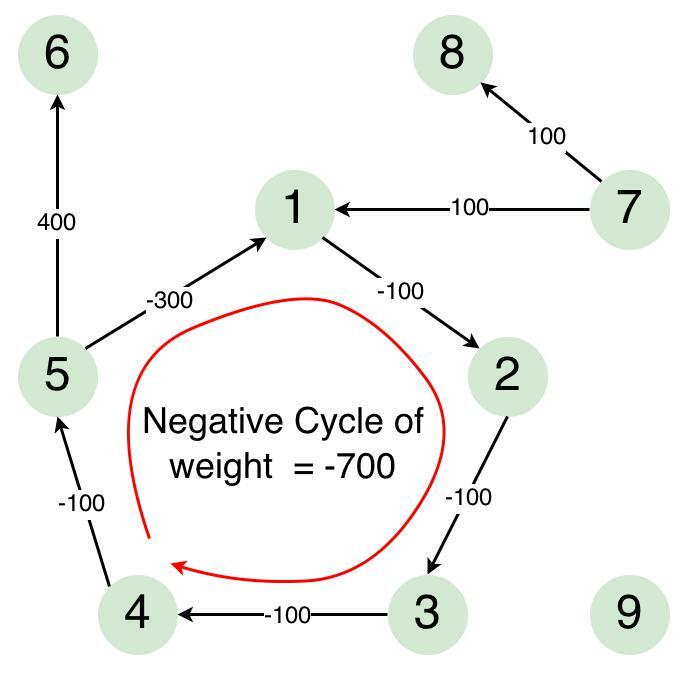 Do you know how can I identify all the vertices in the Negative weight Cycle, instead of just report there is a negative weight cycle? Hello Albus..! I am happy that my post could help you… 🙂 … Coming to your doubt, you can print the vertices of the Negative Cycle too…! In my code for the Bellman-Ford Algorithm, at line number 96, instead of returning false, you must return the value of ‘j‘ at that iteration, which would have the vertex number at which you found that further relaxation was possible. Sorry to bother, I’m having a problem with the printNegativeCycle function. With the edges: (1 2 -10), (2 3 -10), (3 1 -10) everything works fine, but if I reverse the arrows like this: (2 1 -10), (3 2 -10), (1 3 -10) I get Segmentation fault. I don’t understand why. Any idea how can I fix it? Here it is, it’s your code, but I added a global variable named “GLOBAL” that is the vertex found in the last cycle of bellman-ford and I also scan the source vertex for bellman-ford in main. I am just going through perterson Computer Networks book and algorithm CLRS and trying to compare these two.. but they are quite different in approach.. Anyway i am preparing for tech interviews…. Thank you for your wishes vamsi. please go through this below link , if not visited yet.. most of the stories are really inspirational ….. Thank you for your clear cut simple explanation of Bellman ford algorithm. I got doubt here you mentioned under negative cycle paragraph B->C->D cicle once it becomes 1. i thought it is 2 . how it will be 1 please reply me..